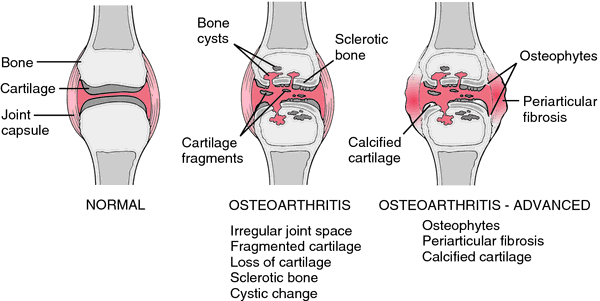 Degenerative joint disease (DJD), or osteoarthritis, is a nonsystemic, noninflammatory, progressive disorder of movable joints that is associated with aging and accumulated trauma. It is characterized by ulceration of articular cartilage that leaves the underlying bone exposed. Irritation of the perichondrium (the membrane of fibrous connective tissue around the surface of cartilage) and periosteum (the fibrous membrane that forms the covering of bones except at their articular surfaces) causes a proliferation of cells at the joint margins. Extensive hypertrophic changes produce bony outgrowths or spur formations that expand into the joint, causing considerable pain and limited joint movement when they rub against each other. Idiopathic osteoarthritis (OA), or primary DJD, can occur unilaterally in one or more joints and is usually associated with wear and tear of the hand, wrist, hip, and knee joints. More than half of all persons over age 65 have evidence of idiopathic OA. Progressive joint deterioration occurs because of age-related changes to collagen and proteoglycans. As a result, joint cartilage has decreased tensile strength and reduced nutrient supply. DJD is related to trauma in one or two joints, particularly the knees. The major weight-bearing joints, the cervical spine, and distal interphalangeal joints of the hand are most often affected. The course of the disease is slow and progressive, without exacerbations and remissions. Patients may experience limitations that range from minor finger discomfort to severe disability of the hip or knee joints. Specific causes of DJD are not known, although some predisposing factors have been identified. Aging, obesity, and familial tendencies are known risk factors. Other risk factors include joint injuries, bleeding into the joint, joint abnormalities, and excessive joint use, as in certain occupations such as high-impact sports, construction work, and dance. DJD is a complex disorder combining the effects of multiple genes and environment, but the genetic component may be significant. Identical twins have been found to have five times the risk of developing severe OA in the knee or hip than the nonidentical twins with which they were contrasted. Symptoms of DJD generally begin after age 40 and are more common in women than in men after age 55. Idiopathic OA affects all races and ethnicities but is more prevalent in Native Americans than other groups. Researchers have found that Black/African American people have more radiographic knee changes than other groups. Women have OA of the distal interphalangeal joints of the hand and the knee joints more frequently than do men, but OA of the hip is more common in men than in women. In Europe, more people report long-standing problems with their bones and joints that they do with hypertension, headaches, depression, or asthma. Prevalence is highest in Spain, Sweden, and the Netherlands. Few data are available internationally, but OA of the knee is common as people age in China. Establish a history of deep, aching joint pain or “grating” joint pain during motion. Determine if the pain intensifies after activity and diminishes after rest and which joints are causing discomfort. Ask if the patient is taking medication for pain and, if so, how much and how often. Ask if the patient feels stiff upon awakening. Determine the relationship of the patient’s stiffness to activity or inactivity. Ask if the joints ache during weather changes. Establish a history of altered gait contractures and limited movement. Determine whether the patient has had a severe injury in the past or has worked at an occupation that may have put stress on the weight-bearing joints, such as construction work or ballet dancing. Ascertain whether a family history of OA exists. The most common symptoms are joint pain and reduced mobility. Observe the patient’s standing posture and gait. Note any obvious curvature of the spine or shuffling gait, which are indicators of limited joint movement. Note if the patient uses a cane or walker. Determine the patient’s ability to flex, hyperextend, and rotate the thoracic and lumbar spine. For a patient with lower back pain, place the patient in a supine position, raise the leg, and have the patient dorsiflex the foot. Intensified pain may indicate a herniated disk; if this occurs, defer the examination and report these findings to the physician. Otherwise, have the patient stand, stabilize the pelvis, and rotate the upper torso 30 degrees to the right and to the left. Support the patient if necessary and ask her or him to bend over from the waist as far as is comfortable. Then ask the patient to bend backward from the waist. Ask the patient to stand up straight and bend to each side. Note the degree of movement the patient is capable of in each maneuver. Determine the patient’s ability to bend the hips. Do not perform this assessment if the patient has had a hip prosthesis. Ask the patient to stand and extend each leg backward with the knee held straight. Have the patient lie on the back and bring each knee up to the chest. Assess internal and external rotation by having the patient turn the bent knee inward and then outward. Have the patient straighten the leg and then adduct and abduct it. Again, note the degree of movement. Listen for crepitus and observe for pain while the joint is moving. If DJD is advanced, flexion and lateral deformities of the distal interphalangeal joints occur. Inspect any nodes for redness, swelling, and tenderness. Observe the patient’s hands for deformities, nodules, erythema, swelling, and asymmetry of movement. Grasp the hands and feel for sponginess and warmth. Observe for muscle wasting of the fingers. Ask the patient to extend, dorsiflex, and flex the fingers. Assess for radial and ulnar deviation. Finally, have the patient adduct and abduct the fingers. Ask the patient about the degree of pain during each of these movements. If the patient has had the disease for some time, explore how it has affected his or her life and how well he or she is adapting to any lifestyle changes. Many elderly patients look forward to retirement and leisure and become depressed about the prospect of pain and limited movement. Trauma from occupational or accidental injuries leaves many individuals unable to work. Initial medical treatment consists of prescribing pharmacologic therapy. An appropriate ongoing exercise program, which includes teaching proper body mechanics, is prescribed by the physical therapist. Therapy may include the use of moist heat in the form of soaks and whirlpools. Hot soaks and paraffin dips may be used to relieve hand pain, and a cervical collar and hand splints may be used for painful joints. A transcutaneous electric nerve stimulator (TENS) may be particularly helpful for vertebral pain relief. The physical therapist teaches the patient to use a walker and cane if indicated. Occasionally, the patient needs to learn to manage activities of daily living in the home with the help of assistive technical aids. If considerable help is required in learning these skills, the occupational therapist becomes part of the team effort. Surgical treatment may be undertaken to restore joint function when conservative treatment is ineffective. Patients who are in relatively good physical and mental condition may be candidates for joint reconstructive surgery (arthroplasty). Other surgical procedures include débridement, to remove loose debris within a joint, and osteotomy, which involves cutting the bone to realign the joint and shift the pressure points to a less denuded area of the joint. An osteotomy requires internal fixation with wires, screws, or plates as well as limited joint movement with restricted weight-bearing for a prescribed period of time. Fusion of certain joints (arthrodesis) may be done for the vertebrae and certain smaller joints when other types of procedures have not been successful in eliminating pain. Fusion eliminates movement in the joint and therefore is undertaken as a last resort. Patients who undergo knee replacement surgery are placed on a continuous passive motion machine, which is set to put the patient’s leg through an increasing range of motion and thus prevent scar tissue. Other Drugs: Glucosamine and chondroitin have shown some success in reducing the pain; intra-articular injection of high-molecular-weight visco supplements, particularly hyaluronic acid, has been successful in decreasing knee pain with OA. Capsaicin (Dolorac, Capsin, Zostrix) has been used with some success for topically treating pain. Some patients may require opioids to maintain quality of life. Teach the patient assistive techniques to manage joint pain, such as meditation, biofeedback, and distraction. When the pain is reduced and mobility improves, encourage the patient to assume more responsibility for self-care. Recommend a firm mattress or bed board for lumbar and sacral spine pain. Apply moist heat pads to relieve hip pain and assist with gentle range-of-motion exercises. A total or partial hip replacement requires limited joint movement and restricted weight-bearing depending on the type of prosthesis and surgical approach. Preventing dislocation of the hip prosthesis is extremely important. Keep the patient from lying on the affected side. Place three pillows between the patient’s legs while she or he is sleeping and when you turn the patient. Avoid hip flexion. Keep the cradle boot in place except for a brief period during a bath. Once the patient is allowed up, instruct her or him not to cross the legs while sitting and to avoid wearing shoes and stockings or bending over. After the recovery time is over, teach the patient to wear well-fitting supportive shoes and to replace worn-out heels. Teach patients who have undergone knee replacement surgery to use a walker or crutches with limited weight-bearing. Advise the patient to use special equipment in the home, such as grab bars, shower seats, and elevated toilet seats. Assist the patient in arranging for a home health nurse to visit and evaluate the patient’s functioning in the home. Assist the patient in arranging ongoing physical therapy in the home. Assist the patient with activities of daily living and teach strategies for managing self-care in the home. Teach the patient to carry out therapeutic regimens, including energy conservation. Suggest the use of a firm mattress and straight-back chairs with armrests. Show the patient how to avoid flexion contractures of the large muscle groups while sleeping and sitting. Teach the patient to avoid putting pillows under the legs while sitting and to avoid sitting in low chairs, which can cause hip flexion. Napolitano, M., Matera, S., Bossio, M., Crescibene, A., Costabile, E., Almolla, J., …Guido, G. (2012). Autologous platelet gel for tissue regeneration in degenerative disorders of the knee. Blood Transfusion, 10(1), 72–77. Innovative treatments for DJD, such as injections with platelet-rich plasma (PRP), may reduce pain and improve joint function and quality of life. A pilot study among 27 patients with DJD who were treated with PRP reported a mean decrease in pain from 8.1 (SD, ± 1.7) pretreatment to 3.4 (SD, ± 2.5) posttreatment using the Numerical Rating Scale. Patients also reported a mean increase in joint function from 36.3 (SD, ± 11.8) pretreatment to 58.9 (SD, ± 9.9) posttreatment using the McMaster Universities Osteoarthritis Index. Ensure that the patient understands the need to rest every hour, space work out over several days, and get at least 8 hours of sleep at night. Ensure that the patient knows whom to call in the event of sudden severe pain (as in a subluxation) or general worsening of the existing condition. Determine whether a home-care agency needs to evaluate the home for safety equipment, such as rails and grab bars, and whether ongoing supervision is required. Instruct patients on salicylates that they may need periodic laboratory monitoring of liver and kidney functioning and that they should consider drug interactions. Review patient medication regimen for interactions with salicylates. Some drugs that potentially are affected by salicylates include anticoagulants, corticosteroids, NSAIDs, urine acidifiers, furosemide, para-aminobenzoic acid, certain antacids, phenobarbital, methotrexate, sulfonylureas, insulin, beta-adrenergic blockers, spironolactone, and nitroglycerin. Instruct the patient to watch out for the symptoms of bleeding, toxicity, or allergies and to report them to the primary caregiver. Instruct the patient not to take over-the-counter drugs or change the dosage of salicylates without consulting the primary caregiver. Advise the patient to take medications with food or after meals to avoid gastrointestinal discomfort. The Arthritis Foundation, which publishes information about arthritis, is engaged in a national education program about living with the condition. Help the patient get in touch with this organization by writing to Arthritis Foundation, 1314 Spring Street N.W., Atlanta, GA 30309, or visiting online at http://www.arthritis.org. A case of Degenerative Joint Disease of a right carpal joint caused by traumatic injury in a cow and its management is reported. The main symptom in degenerative joint disease is pain. Because owners in the final phase recognized pain returning in their dogs given the placebo, researchers determined the medication is effective in cats with degenerative joint disease, Dr. Exploring the Placebo Effect in Caregivers--Us! Pain and stiffness are hallmarks of osteoarthritis, which is also commonly known as degenerative joint disease. The etiology might be of non inflammatory disease conditions which included degenerative joint disease and osteoarthritis, characterised by degeneration of the articular cartilage, hypertrophy of the bone margin and changes in the synovial membrane which might be primary due to aging or secondary due to developmental diseases. The finding could be the breakthrough experts need to create a drug capable of halting and then reversing the degenerative joint disease. Newcastle University and Arthritis Research UK have collaborated to spearhead a pounds 6m experimental tissue engineering centre which hopes to regenerate bone and cartilage by using patients' own stem cells to repair any damage caused by the degenerative joint disease. Newcastle University and Arthritis Research UK are spearheading a pounds 6m experimental tissue engineering centre which hopes to regenerate bone and cartilage by using a patient's stem cells to repair damage caused by the degenerative joint disease. Degenerative joint disease, such as arthritis, and a misaligned or eroded disk are other possible causes. The objective of this paper was to systematically search and assess the quality of the literature on the use of glucosamine, chondroitin sulfate, and methylsulfonylmethane, alone or in combination, for the treatment of spinal osteoarthritis / degenerative joint disease, and degenerative disc disease. 6) Not all patients with psoriasis and degenerative joint disease have true PsA. In this short-term study emphasizing individual response, acetaminophen and celecoxib (Celebrex) are virtually indistinguishable in improving pain, stiffness, and function in patients with clinically diagnosed degenerative joint disease.